Padraig Reidy: When everyone is a journalist, is anyone? If we are all journalists now, what happens to the privileges journalists used to claim? As news spread of a video showing the murder of American journalist James Foley by the Islamic State (ISIS), journalists and Middle East watchers were unanimous on social media: do not watch the film. And for God’s sake do not post links to the film anywhere. Do not give the killers what they want. The descriptions were brutal enough. They echoed back over a decade, to the murder of Daniel Pearl by Al Qaeda linked terrorists in Pakistan 2001. There is a very specific message in the public execution of journalists. It’s a hallmark of extremism, in that it signifies that your movement is far beyond attempting to use the press to “get the message out”, to garner support. This is not about rational grievances the international community could address. This is not about convincing anyone who isn’t already open to your ideas. It’s about rejecting traditional ideas under which the press operates. But this is partly possible because the likes of ISIS no longer need the attention of press to reach the world. Much has been made of the group’s social media presence. It’s genuinely impressive, and, importantly, clearly the work of people who have grown up with the web; people who are used to videos, Instagram, sharable content. They are, to use that dreaded phrase, “digital natives”. They understand the symbolic power of murdering a journalist, but they see themselves as the ones in charge of controlling the message. Media workers are increasingly targeted, while the previous privileges they enjoyed fade away. As I sat down to write this column, the number of journalists arrested while covering disturbances in Ferguson, Missouri stands at 17. According to the Freedom of the Press Foundation, this number includes reporters working for German and UK outfits, as well as domestic American media. Journalists have apparently been threatened with mace. An Al Jazeera crew had guns pointed at them and their equipment dismantled. A correspondent for Vice had his press badge ripped off him by a policeman who told him it was meaningless (in slightly coarser language). The Ferguson story is a catalogue of things gone wrong: racism, disenfranchisement, the proliferation of firearms, a militarised police force (a concept that goes far beyond mere weaponry; this is law enforcement as occupying force rather than as part of a balanced democracy). To single out the treatment of media workers may seem a little self serving, but there is good reason to do so. We are used to telling ourselves by now that journalism is a manifestation of a human right — that of free expression. Smartphones, cheap recording equipment, and free access to social media and blogging platforms have revolutionised journalism; the means of production have fallen into the hands of the many. This is a good thing. The more information we have on events, surely the better. But one question does arise: if we are all journalists now, what happens to the privileges journalists used to claim? Official press identification in the UK states that the holder is recognised by police as a “bona fide newsgatherer”. As statements of status go, it seems a paltry thing. But it does imply that some exception must be made for the bearer. The recognised journalist, it is suggested, should be free to roam a scene unmolested. One can ask questions and reasonably expect an answer. One can wield a video or audio device and not have it confiscated. One can talk to whoever one wants, without fear of recrimination. That, at least, is the theory. But in Britain, the US and elsewhere, the practice has been changing. 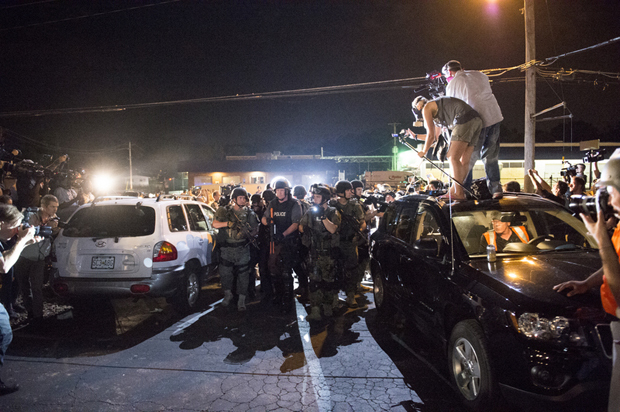 Whether during periods of unrest or after, police have shown a disregard for the integrity of journalists’ work. The actions of police in Ferguson have merely been part of a pattern. The question is whether we can maintain the idea of journalistic privilege when everyone is a potential journalist. During the legal tussles over the case of David Miranda, the partner of former Guardian writer Glenn Greenwald, an attempt was made to identify persons engaged in journalistic activity, without necessarily being employed as journalists. Miranda was detained and searched at Heathrow airport as he was believed to have been carrying files related to Edward Snowden’s NSA leaks, with a view to publication in the Guardian, though he is not actually a journalist himself. The suggestion made by Miranda’s supporters (Index on Censorship included) is that the activity of journalism is what is recognised, rather than the journalist. This may be applicable in circumstances such as a border search, but how would it apply in the heat of the moment in somewhere like Ferguson, or during the London riots, or any of the recent upheavals where citizen footage has proliferated. If someone starts recording a confrontation with the authorities, are they immediately engaged in journalistic activity? Or does journalism depend on what happens to your video, your pictures, your tweets? I can appreciate what’s happening to information, personally. In this form we’re as many steps ahead as we want to be over those who are intent on controlling all channels of information. Overall, if the publisher – be it freelancer or organization backed journalist, shares their sources and have proven to be creditable, I think it’s a good thing for social progress. The media is changing because people are sick of the elites lying to them and because the internet exists. It’s a sign of the times. Perhaps, moving forward, the best consideration is how to teach people how to check sources as creditable. This is a great time to cultivate an international ability to always ask questions. Moving along, I also see the number of arrests coinciding with the changing of nationalism for globalism. Cultures are abruptly being exposed to different cultures. It’s becoming harder for the “information fascists” to hide, which is good, and it’s showing the world where the black holes are, and it’s teaching the working class of the world just how much of the same boat we are all in. We are being given an opportunity to unite, globally and people are doing so. Personally, I am a trained journalistic writer and I think the bottom line is to teach everyone, everywhere – how to pick credible attributions and sources to write from and read about. We have to teach the world how to actually go about reading the news. 2 Monitor the sectarian and factioned corporate owned media of other countries in relation to stories on your country’s leadership because sometimes enemy countries really do get the goods on one another. Never trust that country’s sect/factioned owned media to ever tell a real story about themselves though. 3 Learning how to cross check the info using the supposed “arbitrary media” like BBC, Reuters, AP, Al J. I find Reuters lies for the UN and Pro Nukers. If you get good at cross checking, you’ll figure out world allegiances. 4 Local news services and forums are useful to help build a fuller picture. 5 Science journals are a great place to gather facts for cross referencing. It’s why the US wanted Aaron Swartz to shut up. 6 Learn how to take all that info and cross check it with critics, scholars, authoritative reports, bloggers, tweeters, youtubers, ect… all of the particular location you are reading about. Make sure what they write is consistent with a number of other writers from the area. Build this network up of regular spots you go to for info and your ability to read topics will get easier and quicker. Remember – information has NEVER EVER been perfect. Before the printing press there was illiteracy and verbal disiniformation, the printing press was used for disinformation, and now – well after the printing press we still have illiteracy and disinformation but now, we have a full unadulterated access to quickly cross check, globally. Never ever have we had this luxury, before. The answer to this question comes once you realise that journalism is not actually a ‘profession’. A profession was originally something for which one had to profess an oath in order to be admitted to practice it. As the many disputes over press behaviour and press regulation show, there is no universally accepted code of what journalists must or must not do. There is no body to give any ruling on who is a journalist and who is not. If there was a code of behaviour, then it would go with that code that anyone breaching it would be prevented from acting as a journalist. That is what being in a profession involves. In asking about ‘journalistic privilege’, who are journalists privileged over? It’s arguable that it is not a request for privileges over the authorities, but for privileges over ordinary citizens. The journalist demands to cross a police line which the police prevent members of the public from crossing. The journalist demands that they be allowed to read secret files which members of the public may not read.